Here’s a little money box that makes a perfect gift for a newborn or a small child – loads of cute factor, and style to boot! Someone once told me that elephants with their trunks up are meant to be good luck, and regardless of whether that’s true or not, you’d have to agree you’d be pretty lucky to have one of these cute little guys at your place. We first showed you these cuties in one of our Christmas gift guides, but the recent birth of a brand new baby elephant at Melbourne Zoo has us thinking it’s the perfect time to refresh your memories. Norsu (which actually means elephant!) 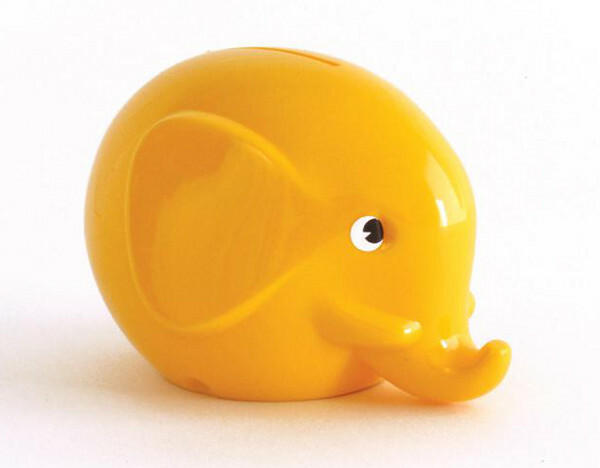 is all about providing Australian customers with the best of European and Scandinavian design, and their retro-styled baby elephant money box is a classic Finnish design. In fact, it’s so popular that it’s been in production for more than thirty years. Available in lots of bright high gloss colours, this plastic money box is just the right size to be a great gift for a new baby, or a small child who has discovered the joy of nicking coins off your bedside table. You can find it at Baby Goes Retro for just $14.95.